Jane Gilchrest working on her overshot pot holder. Jane’s pot holders are one of her best-selling items. Editor's Note: It is with great sadness to report that Jane Gilchrist passed away Friday, March 8, 2019. The West Virginia Public Broadcasting team offers its deepest sympathies and condolences to Jane's family and friends. Click here for Jane's obituary. Most Americans typically wear clothes made in factories overseas. The same goes for fabrics in homes, such as potholders, rugs and blankets. But it has not always been this way. Hand weavers once made a majority of people’s fabrics and rugs using old wooden fashioned looms that one can often find today in a historical museum. But as the textile industry became more industrialized, hand weavers no longer were a necessity. Listen to the story here. However, there are some people who still remember the craft of weaving and even practice it today. One such person is Jane Gilchrist. Her shop is just off a narrow neighborhood road in Stonewood, West Virginia. It is a small, brick store with a sign titled, "Loomy Ladi Handwovens." When she is weaving, Gilchrist sits on a sheepskin covered bench facing the loom. On the day I visited, she wore a green top patterned with teal petunia petals. Her nails were painted a rouge pink. Jane weaving a pot holder. She said she is drawn to weaving because it is a relaxing, repetitive movement that still requires focus. Floor-to-ceiling shelves were filled with colorful yarns, and a hand-woven, baby blue coverlet blanket with little white flowers was on display. In the corner were some of Gilchrist’s square pot holders and scarves for sale. "So this is the overshot pot holder,” she said. "A real pretty earthy green with a natural warp." The small shop is also Gilchrist’s space for creating. In the center of the room are three wooden looms, and one table loom hanging on the wall. All of them are no bigger than a desk, and each held a different project. Several looms even sat, folded up in the corner. When she steps on a treadle, or a peddle, a layer of the tightly strung yarn lifts up, which allows her to thread the colored yarn through. With enough threading she will create a tightly woven item, like a pot holder. Gilchrist has been weaving as a hobby for almost two decades, but it only recently became her main source of income. She grew up in Ohio with eight other siblings and not a lot of money. "I was the next to the youngest and I just always felt lost," she said. "I was the little fat kid without a lot of friends, middle of nowhere living on a farm and I was pretty lonely." She made friends with a woman who was quadriplegic, although she had some use of her arms. This woman introduced Gilchrist to weaving. "She had a big rug loom and she made rugs, and I sat next to her and I got introduced to weaving. I always knew someday I wanted to be a weaver; that just felt right to me." Jane Gilchrest works out of her shop in Stonewood, West Virginia. She recently opened the shop under the name, "Loomy Ladi Handwovens." It felt right because weaving is her happy place. Gilchrist said she finds the repetitive motion relaxing, but also stimulating. "I don't have time to think about what is or isn’t, the good or the bad, and dwell on things I can’t change and can’t control," she said. Later in life, she learned that weaving was a part of her family’s history. She has record that her great-great grandfather used weaving as a source of income during the long, cold West Virginia winters. Weaving was vital in the early settler days in Appalachia, Gilchrist said, adding that it helped create cloth for clothing and blankets – items that were not yet available in the rural region. But as clothing became more available during the Industrial Revolution, weaving became a lost art. "It went from being an essential, 'you have to do this,' to being a hobby," she said. Gilchrist does her part to help keep an Appalachian tradition alive. "When I sit down at one of those looms and I start creating a piece of cloth, I feel connected to my ancestors. I feel connected to the people that have come before," she said. Over the years Gilchrist has become a reputable weaver. She is part of the Tamarack Foundation, an organization for professional artists that is not easy to get into. She sells some of her products, like the pot holders, through Tamarack. She also has her master’s in education, so she has developed several weaving tutorials for classroom settings. In fact, about 60 percent of her income is from teaching weaving. But her biggest claim to fame is something she calls "Mug Ruggin’ It." It is a hand-woven rug for one’s coffee mug. 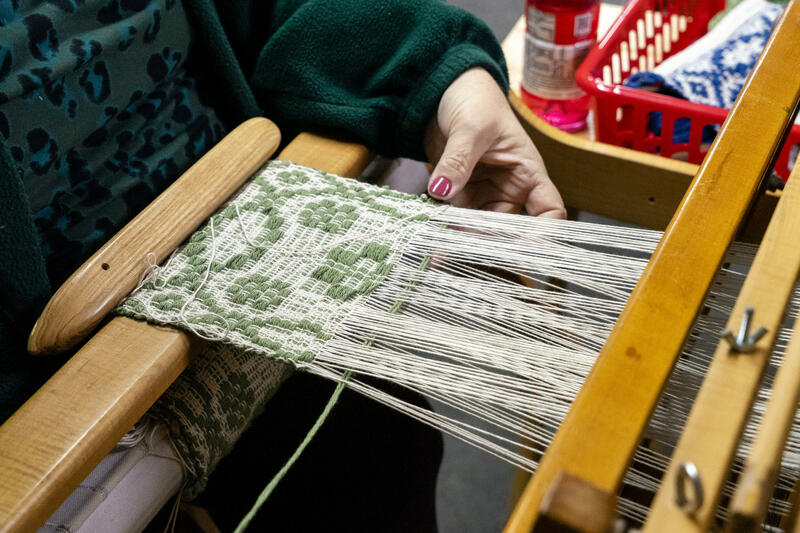 Jane teaches "Mug Ruggin It" as an informal class at several West Virginian art festivals and fairs, where people can weave the rugs themselves. It’s a spinoff of a traditional Appalachian rag rug, just downsized. Over the past five years, about 3,000 people have been through the "Mug Ruggin It" program, Gilchrist estimates. Jane dying fabric with natural indigo dye. She tries to die her fabrics and threads whenever she can to keep her weaving as traditional as possible. "I hope when I’m old and decrepit, and I’m walking through a craft show or flea market and I see somebody who’s got their wares for sale and I say, 'Where’d you learn to weave?' And they say, 'Oh, well I went to the Vandalia festival and there were these people who set up these looms. I did this thing called ‘Mug Ruggin’ it’ and I fell in love with weaving.'" Gilchrist keeps her weaving as traditional as possible. She has even learned to dye her own yarn, as well as spin her own wool – which she has dedicated a decent amount of her living space to. She has a yarn dying station setup near the laundry room, a wool spinner near the T.V. and another loom in the corner. Some people might caution turning a hobby into a livelihood, but Gilchrist says it's not work for her. She says she knows she will never get rich off it either, but that's OK.
"But if I can make the world more creative, and they understand our heritage as we get further and further away from those days, and if I can share that, I think I’ll have done something pretty successful." This story is part of an episode of Inside Appalachia that explores traditional folkways. To listen to the full episode click here. 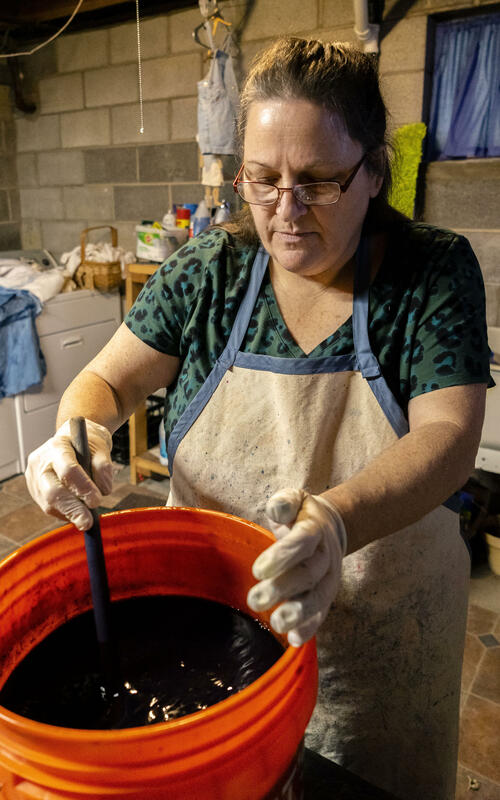 This week on Inside Appalachia, we’ll hear from Appalachians who have a knack for making things with their hands -- people who make the essentials of life in the old ways. 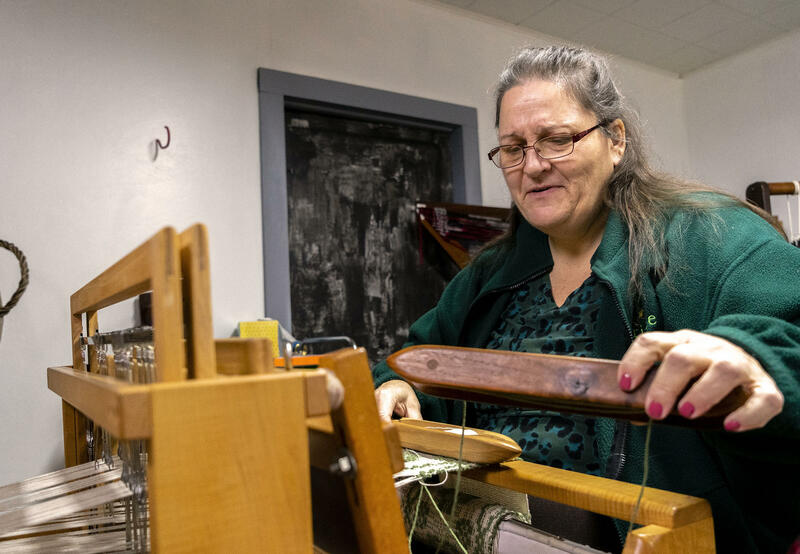 “And when I sit down at one of those looms and I start creating a piece of cloth, I feel connected to the place of my ancestors, the people who have come before,” said weaver Jane Gilchrist. The Vikings used wooden boats for conquests all over Europe. But was their real secret weapon the wool sails that propelled their warships? Marketplace host David Brancaccio sat down with author Kassia St. Clair to talk about her new book, "The Golden Thread: How Fabric Changed History." Below is an edited transcript of their conversation. Along Davis Creek, in Loudendale, WV, outside of Charleston, there’s a long green building on the side of the road with the words “Charleston Broom and Mop Co.” painted on the side. That building is the workshop of James Shaffer, who at age 87, is the last hand-made commercial broom maker in the state. He first learned the trade in 1946, meaning he’s been making brooms for 70 years.